Image of the center and neighborhood of São Félix. 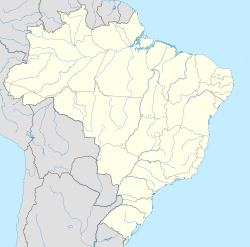 Brumado is a Brazilian municipality in the interior of Bahia, in the Northeast region of the country, precisely in the mesoregion of the Center-South of the State, in the homonymous microregion, 555 kilometers from the state capital, Salvador. Its territorial area is 2 207,612 square kilometers, the headquarters`s area occupyin 2 174 square kilometers, have altitude of 454 meters. According to data from the Brazilian Institute of Geography and Statistics (IBGE), in 2016 its population was estimated at 69 473 inhabitants. The Human Development Index (HDI) is 0.656 (average). A survey by the Federation of Industries of the State of Rio de Janeiro (FIRJAN) found that Brumado is considered to be the sixth most developed municipality in Bahia, based on the FIRJAN Municipal Development Index (IFDM 2013) published in 2015. A query made exclusively by Urban Systems, in January 2016, for Exame Magazine, concluded that the city is among the 100 best in Brazil to invest, ranking 84th in the ranking, totaling 2 306 points. A study carried out by IBGE, in 2012, concluded that of the 64 602 inhabitants, 50 899 were literate, 31 747 were men and 32 855 were women. The per capita income was R$12,144.11, and in distribution between rural and urban areas, in the private households in the rural area, it was R$217.00, and in the urban area it was R$333.33. The fleet of motor vehicles, such as road transport, including motorcycles, as well as tractors and trucks totaled 31 000. The city is notorious as the "Capital of Ore", Because it has a large amount of minerals in its subsoil, which is the basis of its economy, and has large mining companies that carry out their extractive activities in Serra das Éguas. (Das Éguas Mountain), which, by the way, also is one of the tourist points of the municipality, to form mountainous landscapes. Brumado makes municipal boundaries with Livramento de Nossa Senhora, Dom Basílio, Aracatu, Rio de Contas, Malhada de Pedras, Tanhaçu, Ituaçu, Rio do Antônio, Lagoa Real and Caraíbas. For making border with the city of Rio de Contas through the river that has the same name, consequently also makes border with the Chapada Diamantina. The city has a privileged location allied to other benefits, such as important road junctions such as BA-262, BA-148 and BR-030, also counting on the Centro-Atlântica Railroad (FCA). There are several theories on the origin of the name Brumado. According to Teodoro Fernandes Sampaio, the name "Brumado" originates from a Tupi expression: Itimbopira (Y-timbó-pyra), which means misty, covered with haze. According to Jose Dias, former priest of the region, the name originates as fog in the morning descends from the mountains to the north, Serra Geral and Chapada Diamantina, covering the city. Another theory says the origin of the name Brumado is attributed to the word bromo - a word that during the times of mining in the Brumado River was used by the miners and bandeirantes to distinguish loss or deception, mystification or disappearance of the gold in the mining or stream that was supposedly rich in that ore. The Sobrado do Brejo (painting by Alessandro Silva) was a 19th-century mansion. It was located in the Serra das Éguas in Brumado. It was the residence of the gentlemen colonels (the lords of Sobrado do Brejo). Today, it belongs to Magnesita. In the 18th century, the bandeirante Francisco de Souza Meira and his team left the present municipality of Livramento de Nossa Senhora, crossing the Brumado River, advancing along the right bank until reaching the mouth of the Do Antônio River, arriving in indigenous territory, Tupinambás ferocious, and between them a great fight was fought, near the area where today it is the seat of the municipality of Brumado. It was the first part taken and was named "Conquest", then founded a farm called Serra das Éguas. Although these Indians strongly resisted the attacks of the captain and his group, they gradually dispersed, troubled by the presence of white men. In the future, the Serra das Éguas farm was acquired by João Antunes Moreira, who in turn left for his son, the catholic priest André Antunes da Maia; who finally sold it on June 30, 1749 to José de Souza Meira, son of Francisco de Souza Meira, for $462,700 (1 million, 462 thousand and 700 réis), with 232 heads of cattle, 105 heads of equine cattle and a slave named Manuel. In this way, the lands returned to the hands of the Meiras. In 1755, Campo Seco farm was bought by the Portuguese Miguel Lourenço de Almeida (family of the Holy Office), a clan of the Canguçu family in the municipality. The Serra das Éguas farm was near the area that is today the city of Brumado. It was located on the south side, lower part of a mountain range, today called Serra das Éguas, known for the deposits of magnesite and mineral talc. Over the years, a small settlement grew more or less ten kilometers by the same margin of the river, thanks to the successes of the adventurers who worked hard to farm and To livestock, giving life to the town that would later be the seat of the municipality. When settled, Bom Jesus dos Meiras belonged to Livramento do Brumado (current Livramento de Nossa Senhora). On June 19, 1869, still under the name of Bom Jesus dos Meiras, the then vice president of the province of Bahia, Antônio Ledeslau de Figueiredo Rocha, signed Provincial Decree-Law No. 1091, thus transforming Bom Jesus dos Meiras in a district of the same name, annexing it to Caetité, who was already emancipated. Soon after, Antônio Pinheiro Pinto Canguçu, the second master of Sobrado do Brejo, contributed financially and with labor to build the Chapel of Bom Jesus, attending the requests of the inhabitants; Today, the old chapel is the mother church of Brumado, that at that time was called Church Senhor do Bonfim, in honor of the patron of the city, Bom Jesus, and had like first vicar the priest Jose Mariano Meira Rocha. Bom Jesus dos Meiras separated from Caetité in 1877, receiving the title of village. The author of the project was a deputy from the province of Bahia, Marcolino Moura. The political leader at that time was Colonel Exupério Pinheiro Canguçu, the fourth and last lord of Sobrado do Brejo. Political emancipation occurred on June 11, 1877, with the creation of Provincial Law n ° 1756. The first City Council of Bom Jesus dos Meiras was created on February 13, 1878, composed of the following persons listed below and their Respective positions: President: Colonel Exupério Pinheiro Canguçu; Secretary: Belarmino Jacundes Lobo; Prosecutor: Rufiniano de Moura Amorim; Supervisor: Plácido Guedes d'Oliveira; Porter: Francisco Alves Piranha. In 1948, Armindo dos Santos Azevedo took office as the first mayor elected by direct vote. The merchant and cattle rancher was elected in three terms: 1948 - 1950, 1955 - 1958 and 1963 - 1966. In its management, the municipality achieved great advances, such as water supply, electricity and paving of many streets and squares in the city center. The energy in Brumado in the 1940s to 1970s only worked until 9:30 p.m. It was from then on that the energy began to function in an integral way. In 1962, the districts of Santa Bárbara dos Casados, Olhos d'Água and São Pedro would have their toponyms changed to Ubiraçaba, Itaquaraí and Aracatu, respectively. From 1967 to 1970, the mayor was elected doctor Juracy Pires Gomes, with the support of partner Armindo dos Santos Azevedo. In his mandate important works were carried out, such as the new city hall, the new municipal market, the city's first public library; The main one was the dam of the Do Antônio River that would supply the city until the year 2010. At the beginning of the 20th century, the economy was based on agriculture: large-scale cotton farming, coffee and cereals, and cattle raising, goats, sheep and cattle, favoring the export of sheep skins raw or tanned, dry leather and salty, as well as lump cotton and live cattle. Cotton was the culture that most contributed to the economic development of the municipality. Between 1930 and 1955, the production was so great that the producers started to benefit it in the field even using handmade machines. Faced with the success of cotton growing, modern cotton factories were installed in the city. The municipality had six plants in operation. Since 1980, the crop has declined, due to several factors, as an interruption of financial aid by the government, (such as crop insurance), cotton boll weevil (pests that destroy crops), high interest rates for production financing, and of the processing. Currently, the production of passion fruit has been outstanding, in the district of Itaquaraí, one of the largest production locations in Brazil. In 1930, two important events marked the economic history of the municipality: the arrival of the mining company Magnesita S.A., founded by two French friends naturalized Brazilian and resident in Brazil, Miguel Pierre Cahen and Georges Louis Minviele - in partnership with Antônio Mourão Guimarães -, a politician of the time, and the construction of the Federal Railroad Network (RFFSA), which would facilitate the transportation of the newly discovered ore to the port of Aratu in Salvador. Both events occurred in 1939. The Magnesita company was authorized to operate in 1940 through Decree nº 6220 and since then, it has exploited most of the magnesite and mineral talc reserves contained in Serra das Éguas. In the 1970s Brumado arrived at the Brazilian Refractory Products Industries (IBAR S.A.). The company interested in extracting magnesite has established its facilities in the northern part of the saw. In the following years, the municipality witnessed great changes, such as large-scale population growth, construction of houses and commercial establishments. Faced with this great attraction, people from other cities were arriving, commerce strengthened, and the city of Brumado became known by recent events. To the south of the former Serra das Éguas farm was formed a kind of closed condominium: the Catiboaba village; The Presidente Getúlio Vargas village was also formed around the company, fruit of the flow of workers who came from the most varied places to work in the mines of magnesite and mineral talc. In 1969, it was the turn of Xilolite S.A., which also settled on the north side of the mountain range and has since exploited magnesite and mineral talc, with the acquisition of one of the mines in 1973. In 1993, Matsulfur, a cement factory, later acquired by Lafarge, under the name Cement Brumado, today Cimpor, Cimento de Portugal (Cement of Portugal), belonging to InterCement (Camargo Corrêa Group). The municipality of Brumado is located in the Center South (or Southwest) of Bahia, in the region known geographically as the Polygon of the Droughts, in Serra Geral, under the coordinates: 14 ° 12 '13 ", south latitude; 41 ° 39 '55 "west longitude, at 454 meters altitude and is 555 kilometers southwest of Salvador. The urban area covers an area of 2 174 square kilometers. There is no information if there is a point higher than the Serra das Éguas peak, probably this is the highest point of the municipality, with 1 100 meters. The municipality limits with Livramento de Nossa Senhora and Dom Basilio, to the north; Rio de Contas, Ituaçu and Tanhaçu, to the northeast; Aracatu, to the east; Rio do Antônio and Lagoa Real, to the west; Malhada de Pedras to the southwest and the Caraíbas to the south. Its micro-region has a homonymous name. The urbanization rate is 69.86%, population density is 29.01 inhabitants per square kilometer. The municipality of Brumado is characterized by mountainous formations typical of the Serra do Espinhaço (Mountains of the espinhaço), which is the mountainous chain that occupies much of the southwest of the State and which belongs the relief of the municipality. The relief of Brumado is very bumpy, presenting mountainous areas denominated mountains and/or altomontanas, like the Mares sierra (Serra das Éguas) and Black stone hill (Morro da Pedra Preta). There are also level areas, which are flat and / or wavy forms, which make the transition between the upper and lower areas, forming species of stairs. Also has flat and flat relief shapes. In general, the Brumadian relief is quite rugged, slightly undulating and presents erosions due to the floods, favorable characteristics for biodiversity, contributing to a wide variety of species, both in flora and fauna. The municipality of Brumado is part of the De Contas River basin and the Of Antônio River sub-basin, which also includes the municipalities of Caculé, Rio do Antônio, Licínio de Almeida, Guajeru and Malhada de Pedras. The main drains of the Do Contas River basin are: Brumado River, São João River, Santa Maria Stream, Do Antônio River and Gavião River; The main tributaries of the Do Antônio River are: Paiol River, Do Salto River and Do Quirino Stream. The Antônio River Basin has an area of 6,540 square kilometers. Two of the great tributaries are born in very different places: the Brumado River, affluent of the Contas, is born in the Saw of souls (Serra das Almas) and Do Antônio River in General Saw (Serra Geral), in the municipality of Licínio de Almeida. In De Contas River is inserted the dam of Cristalândia Which supplies the city, and in Do Antônio River, the dam of the Do Antônio River, which supplied the urban population by 2010. Most rivers are temporary, such as Do Antônio River and São João River. The De Contas River Basin has annual precipitation between 700 and 800 mm, with little possibility of major floods. The average temperature is 22 °C. It is characterized by two biomes: Caatinga and Atlantic Forest (Mata Atlântica), which have suffered deforestation, to give way to agriculture and urbanization. It covers an area of 4 477.62 square kilometers. The municipality that most demands water from the basin is Jequié. The sub basin of the Of Antônio River has suffered over time with water degradation, due to the intense pollution of its waters, deforestation of the riparian forests and the excess of dams that are built. The main drainage of the sub basin, the river of the same name, has as its main function human supply, with minimum use for irrigation. Graph of occurrences of minerals in Serra das Éguas. Geologically, Brumado is located in the São Francisco Craton, precisely in the Gavião Geological Block, in the Greenstone Belts Umburanas. In these areas, the rocks are formed by metavulcanic sequences, that is to say of very old volcanic actions, which favored the formation of metamorphic rocks of a great quantity of minerals, metals and nonmetals such as iron, manganese, emeralds, quartz, granites and different types of ornamental stones. The chart below shows the main occurrences of minerals in the Brumadian basin and their corresponding percentages. In geochronology studies it was verified that the oldest rock formations of South America, with the age of 3.4 to 3.5 billion years, are between the municipalities of Brumado and Vitória da Conquista. In the geological scale, the soil is from the Paleoproterozoic Age or the Lower Proterozoic Age, equivalent to 1.6 and 2.5 Gigaannum. It was at this age that the oldest rocks and the richest soils in any and every type of ore were formed. This explains why Serra das Éguas (Das Éguas Saw) is so rich in minerals. In addition to magnesite, Brumadian soil contains all these minerals already mentioned above, which leads us to conclude that it is one of the richest soils in Brazil and one of the oldest in the world, making it one of the most studied by geologists. The predominant climate in Brumado is the tropical steppe, making a transition with the semi-arid climate, classified as BSh (hot and dry), according to Wladimir Köppen and Rudolf Geiger, however, there are much lower temperatures at the top of the hills, always citing as an example the Das Éguas Saw and Pedra Preta Hill, one of the highest points of this mountain range. The rainy season is concentrated between October and January, with a difference of 128 mm between the driest month of August and the driest month of December. The rest of the year, the rains are scarce. The average temperature is 23.8 °C, with an average annual rainfall of 590 to 600 mm. same with the scarcity of rainfall, the city already suffered with excesses, as in 1968, when the Do Antônio River suffered a great flood at the point of water reaching the center of the city, after passing over the bridge of the São Félix neighborhood, which Was caught. Other floods occurred in 1982 and 1992. It also suffered major droughts, as in 1998. The months of January of the years of 2015 and 2016 were considered "good of rain", registering 350 mm and 530 mm, respectively, the latter almost reaching the annual average. The highest accumulated of that month happened in 1985, when it was registered more than 1 100 mm. In the table below, one can more accurately understand the climatic effects in the municipality in a normal year. Umbuzeiro, tree of the umbu fruit. Along the municipality, there are four types of vegetation existing in all Brazilian territorial extent: Ciliar Forest, Cerrado, Rupestre Field and Caatinga, which is the predominant vegetation. In the ridges of the hills and mountains, such as Das Éguas Saw and Da Pedra Preta Hill, and on the banks of the rivers are closed and small tropical forests, called "generals". Campos rupestres, vegetation typical of montane and higmontanes environments, occur at altitudes above 900 m, as is the case again in the Das Éguas Saw and Da Pedra Preta Hill; Is characterized by the predominance of shrubs and/or herbaceous plants, precisely in the mountainous summits of the mountains. The species occurring in the Caatinga are very diversified, some with important commercial and ecological value, such as aroeira (Astronium urundeuva) and braúna, or baraúna (Schinopsis brasiliensis), angico and black angico (Anadenanthera macrocarpa) and umbuzeiro (Spondias tuberosa), one of the which is protected by Municipal Law No. 1030 of 1992. Other notable species are the juazeiro and jatobá, and other species: cassutinga (Caesalpinia microphylla), black maria (Vitex sp. ), umburana or northeastern cumaru (Amburana cearensis), white jurema (Mimosa sp. ), among many other creeping and shrub plant. Jaguarundi, The largest cat in the region. Although the municipality has small forest islands called Riparian Forests, often located on the banks of the rivers and streams of the region, the fauna is composed of animals adapted to the Caatinga. Animal biodiversity often ends up having its natural habitat threatened by miners, ranchers and hunters, who aim at territorial expansion, exploitation of natural resources and also illegal trade in animals; Consequently, it ends up entailing a predatory activity unrestrained and without any control with respect to the ecological imbalance that this action can cause. Brumado has a very wide biodiversity, both vegetal and animal, ranging from small specimens to medium-sized animals threatened with extinction. In the fauna, a reasonable amount of mammals prevails; At least 148 species were cataloged in the interior of the municipality and in the surrounding regions, practically all threatened with extinction. They are distributed between Cerrado and Caatinga; As the highlight is the puma known as suçuarana (or Jaguarundi), being one of the species most endangered and the mocca (Kerodon rupestris), because it is endemic (exclusive of the region). Other examples are: caatinga deer, armadillo or tatupeba (Euphractus), paca (Agouti paca), possum (Conepatus semistriata), fox and raccoon (Dusicyon thous), mallard cat or puma yagouaroundi (Herpailurus yaguaroundi), ferret (Galictis vittatus), coati (Nasua nassua), among others. Disordered hunting of these animals for food consumption is the factor that most contributes to putting animals on the extinction list. There are also a myriad of birds that are part of the fauna; Most of them are targeted by breeders and collectors, favoring the trafficking of these animals. Among the most common and well-known are: canary, quail, partridge, northeastern cardinal (Paroaria dominicana'), Caatinga bacural (Chordeiles pusillus), canan crow (Cyanocorax cyanopogon), mustache(Sporophila lineola), cowgirl-heron (Bubulcus ibis), Great Blue Heron (Casmerdius albus), garrincha (Thryothorus genibarbis), seriema (Cariama cristata), fire sanhaço (Piranga flava), blackbird or coqui (''Gnorimopsar chopi ), white anu (Guira guira), black anu (Crotophaga ani), woodpecker (Dryocopus lineatus), crack iron (Saltador simillis), vi-vi or fim-fim (Euphonia clorotica) Caatinga (Aratinga cactorum), sofrê (Icterus jamacaii), canary of the kingdom, canary of the earth, sabiá and many others. Due to size, quail and partridge are hunted constantly inside the municipality. The species of amphibians and reptiles present in the local fauna are small animals, like calango (Tropidurus torquatus). Of these species, the green calango (Ameiva ameiva) is the most commonly seen because it has no commercial value, is not edible, nor is venomous. The teiú (Tupinambis merianae) and the armadillo are well-hunted animals. The best-known snake species are rattlesnake (Crotalus durissus) and jararaca (Bothrops jararaca), both are venomous. In the 2010 census, the population was 64,602, of which 31,747 were men and 32,855 were women. The urban resident population was 45 131 inhabitants and in the rural area, 19 471. With an area of 2 207,612 square kilometers, the headquarters area occupying 2 174 square kilometers, its population density is 29.01 inhabitants per square kilometer. See below the evolution of population growth, according to the City Hall. Between 1970 and 2016, the population had an increase of 31 169 inhabitants. Bahia is a very culturally diverse state and when it comes to religion it could not be different. Nevertheless, many who attend catholic cults also attend cults of religions of African matrices, such as umbanda and candomblé. In Brazil, all who are baptized in the Catholic Church are considered Catholic, even if they practice another religion. In Brumado, in 2012, according to data from the IBGE, 50 869 people professed Catholicism, 7 422 identified themselves as evangelicals and 994 people identified themselves as spiritists. Of those who professed umbanda or candomblé, they were not even mentioned; But this does not mean that religions of African matrices are not present. There are no numbers on these religions in Brumado, but they do exist, and there is information in the city that is the largest center of candomblé in the world, in the shape of a castle. According to the Brazilian Constitution of 1988, Brumado is part of a presidential republic, based on the Democratic government of the United States model. The municipal administration is in charge of the Executive Branch and the Legislative Branch. Until 1930, the Brazilian municipalities were governed by the mayor of the corresponding municipality, called intendants or executive agents. After the Revolution of 1930, the municipal powers were divided between executive and legislative. In 1877, the provincial deputy Marcolino Moura elaborated a project calling for the political emancipation of Brumado, then called Bom Jesus dos Meiras. Brumado, then, emancipated himself from Caetité at the time of coronelism, on June 11 of that year. The city council was created on January 13 of the following year, when Colonel Exupério Pinheiro Canguçu, the fourth and last lord of Sobrado do Brejo, became the first intendant. Currently Brumado is part of the 90th electoral zone of Bahia with more than 66 061 voters, counting with the voters of the municipalities of Aracatu and Malhada de Pedras, of which 47 845 are in Brumado. The legislative chamber is composed of 13 councilors elected from among the 72 candidates who ran in the 2012 elections. To better serve the electorate, the new headquarters of the electoral forum was inaugurated in 2013. The municipality of Brumado is composed of three districts: Ubiraçaba, Itaquaraí and Cristalândia; And more than 30 neighborhoods, as Apertar do Morro I and II, Centro, Cidade das Esmeraldas, Feliciano Pereira Santos, Jardim de Alá, Malhada Branca, Santa Tereza, São Félix, São José, São Sebastião, Tanque do Abaeté, Baraúnas, Dr. Juracy, Esconso, Flores, Ginásio Industrial, Centenário, Jardim Brasil, Maria José Viana, Mercado, Nobre, Norberto Marinho, Novo Brumado, Olhos d’Àgua, Parque Alvorada, Rodoviário, Vila Presidente Vargas, Brisas I, II, III and IV and São Jorge. Trade is very developed, and the city has seven banking institutions: Itaú Bank, Bradesco Bank, Do Nordeste Bank, Do Brasil Bank, Caixa Bank, Sicoob Bank and Do Povo Bank. From the discovery of the mines of magnesite and mineral talc, the city began to develop, and with that the commerce was strengthened. Bradesco Bank In the Armindo Azevedo Square, downtown. The primary sector, which encompasses extractive, livestock and agricultural activities, is the sector with the lowest participation in the Gross Domestic Product (GDP) of the municipality. It is not such a strong economic base. In 2006, the Superintendency of Economic and Social Studies of Bahia (SEI) published data, where agriculture and cattle raising appeared in that year with only 5.04% of the municipal GDP. Although this sector has a minimal contribution, it can highlight some important activities. In agriculture, crops such as cotton stand out, with 800 hectares planted and harvested; Beans with 2 000 hectares planted and harvested; ricinus or mamona, 200 hectares planted and harvested; watermelon 350 hectares, planted and harvested; And umbu, which is cultivated naturally, without human intervention, for being native, therefore, present in all extension of the municipality. Other low-productivity crops are: mango, with 25 hectares planted and harvested, and coconut-bay with 20 hectares planted and harvested. These data are from the Brazilian Institute of Geography and Statistics (IBGE) in 2014. In livestock, cattle with 45 105 heads and galiform with a total of 87,654 heads, 37,657 heads of chickens. The goats totaled 29,654 heads; Sheep, 13 534 heads; 16 326 heads, according to IBGE data in 2014. According to the (SEI), in 2006 the industry accounted for 52.31% of the municipality's GDP. This percentage is obtained as a function of mineral extractive activities by the companies Magnesita S.A., Xilolite S.A., Ibar Nordeste S.A. and Cimento Cimpor. Mining is the largest source of wealth in the municipality and generates employment for the majority of the population. Brumado has rich deposits of magnesite, mineral talc and other minerals such as vermiculite, dolomite, rock crystal and granites of the most varied types. The mineral magnesite is the main product of the mining industry, and of all the mines of this open-air ore existing in the world, Brumado is the third largest. It also has the second largest mineral talc mine in Brazil. The secondary sector is closely linked to the primary sector. Since there are few processing industries in the municipality, much of the primary sector's share is consequently integrated into the secondary sector because of mineral extraction - since the mining industries themselves are part of the two sectors - since they extract Ore and manufacture various products from its own extraction, along with other small industries, including cement and metallurgical industries, contributing to this sector have great potential. However, mineral extraction potential is not added to 5.04% of the primary sector, but to the secondary sector; If this happened, the primary sector would have a higher percentage. The miners, in addition to extracting the primary resources, manufacture some products for direct consumption, such as medicinal talc, cosmetic talc and processed mineral talc for the manufacture of pulp and an infinity of products for consumption in agribusiness. Given that 52.31% of municipal GDP is mixed with extraction and transformation, it is assumed that this percentage is technically divided between the secondary sector and the primary sector. The tertiary sector accounts for 46.24% of the municipality's GDP, the second largest sector contributing to the municipal economy. Trade plays an important role in the economic development of the city. Many of the trades are associated with the City Council of Shopkeepers (CDL). There are more than 1 800 registered companies in every municipality, of which 1 775 are active; Between industries, stores and service providers. These companies employed 12 677 people who, together with all the employed persons, obtained the value of 14 913, in active companies and with due registration (IBGE / data of 2012). Service companies that performed federal and state works beginning in 2011 employed large numbers of people, including from other municipalities. The largest employers of these companies were Grupo Andrade Gutierrez and VALEC, responsible for the construction of the West-East Integration Railway (FIOL). Until 2013, these companies and their subcontractors played an important role in the local economy, in addition to the miners who invested in their facilities between 2011 and 2015, generating employment for the city's population and also for other neighboring cities.91 In the 2014 and 2015, some companies that provided services to the State had their works suspended several times, which caused financial insecurity for employees and for commerce. Service delivery has a greater share absorbed by the mining industry, either by constant services, or by temporary services resulting from casual investments. Civil construction has also contributed a lot to economic growth and since 2009, projects have been carried out and, although they slowed down in 2015, the city still sees works being carried out, with expectation of other civil construction projects to be executed. The northern part of the city is the one that has contributed the most to small works, due to the large number of houses built recently. The city has only one public hospital, however, counting on several health posts, distributed among the neighborhoods. It has 23 units with coverage of the Unified Health System (SUS) that perform care from small to medium complexity. The good thing is that the city can be considered well served by clinics that perform the most diverse types of tests and specific treatments. In 2012, the municipality had a total of 122 health facilities, 2 of which were state, 34 were municipal and 77 were private. The sanitation in the city is satisfactory, but although it has a sewage network, the waste is directly thrown into the bed of the Antônio River, which cuts through the city. The Baiana Water and Sanitation Company (Embasa) does not treat the sewage network, and the city has long been channeling the galleries to the Do Antônio River. In 2005, the construction of the Cristalândia dam in the district of the same name began in Rio de Contas after a marked drought between 1998 and 1999. The Brumadian population at that time had the water supply compromised in its totality, being supplied by tank truck. Before the construction of the Cristalândia dam, the city was supplied by the old dam of the Do Antônio River, Which was analyzed belatedly and the water declared as unfit for human consumption, because it contains excess of minerals of various types. Thanks to the attendance of the public power to the appeal of the population, finally the reservoir was built, and the municipality has not suffered any major problems with water supply. In 2012, the IBGE indicated that in 17 159 homes had treated water. The selective collect is also done. To meet the requirements of Federal Law No. 11445, of January 5, 2007, regulated by Federal Decree 7217 of June 21, 2010 — Which obliges municipalities to create efficient means to eliminate garbage and other waste produced — It is discussed the elaboration of the new sanitation plan for the city. In the rural zone, sanitation follows what is common in these localities: Water is stored in artesian wells, small lakes. With the government's encouragement, through the Água para Todos Program (Water for All), cisterns are built on the floor for consumption, or boxes of fiber or polyethylene are distributed for the storage of water, for human consumption. Brumado has a campus of the State University of Bahia (Uneb), the only public university in the city; Baiano Federal Institute (Ifba), which also encompasses superior courses to its curriculum. The National Industrial Learning Service (SENAI) and the former Luís Eduardo Magalhães Model College (Ceep) offer technical and professional courses, as well as other private technical schools. In 2010, according to the IBGE census, 50 899 people were literate. Check the table below for a portrait of education in the municipality in 2015. Colégio Objetivo de Brumado (Cob). The Municipal Assistance Program for Learning (PMAA), which was financed only with municipal funds, began to be implemented between 2009 and 2011, had a high investment and won the Innovation Award in Educational Management of the National Institute of Studies and Research (INEP). Its objective was to implement full-time schools in the municipality. Approved by 80% of the parents of the students, this initiative, besides contributing to their intensive learning, also helps to keep them away from risks, as contact with drug traffickers, for remaining the rest of the day unoccupied by the streets. Full-time classes have a nine-and-a-half hour period and reconcile morning and afternoon shifts. School reinforcement classes - mainly in mathematics — diversified activities and constant meetings between teachers were responsible for much of the success of the project. A high investment was made to improve the quality of the municipal education network. The number of classrooms doubled, and reform of other schools was carried out. In the enlargement of the network, also were constructed auditoriums, poliesportivas courts with dressing rooms, computer rooms and industrial kitchens. In addition, these schools have four meals a day. Social inclusion is also practiced in these schools, and students with different types of disabilities receive specialized treatment. Although the federal government's incentives are minimal and insufficient, the municipal government has so far sought partnerships and participation in federal education programs such as the National Education Program and the National Literacy Program in the Right Age. The public security in Brumado is in charge of the civil and military police of Bahia, besides the municipal guard. The civil police has a headquarters called the 20th Regional Police Coordination of the Interior (20th Coorpin), and the military police have the 34th Independent Military Police Company (34th CIPM). Although we do not find the percentage of crimes in the municipality, it is verified that in Brumado there are also big problems, such as the police deficit and the lack of financial and social incentives of the state government. This causes the number of armed robberies to increase significantly. The year of 2013 was the most violent of the last ten, registering 20 homicides. Human development services and public services, such as paving, construction of galleries for sanitary sewage, etc., are under the responsibility of the Municipal Department of Infrastructure. Essential services such as piped and treated water and electricity are provided by state-owned companies in Bahia. Embasa is responsible for the provision of sewage and water supply services, and the State Electricity Company of Bahia (Coelba) provides public services for the supply of electricity and maintenance of the electricity grid. The Brumadian population enjoys satisfactory means of communication, as a sign of four cellular operators: Claro, Vivo, TIM and Oi; Several news sites, the main ones are: Brumado Agora, Brumado Notícias, Destque Bahia, Portal Brumado, 97 News; Two radios transmitted in modulated frequency (FM): Alternativa 97.9 and Radio Nova Vida 87.9; And two newspapers in printed and online versions: Tribuna do Sertão and Jornal do Sudoeste; And a bimonthly magazine: Entrevip, also with printed and online versions, focused on the world of fashion. Transportation services are satisfactory. The city has a circular bus company that makes lines between Neighborhoods and village and also carries out transportation of employees of companies of the city. There is a bus company that does intercity and interstate transportation and tourism trips. Brumado has a road complex that gives access to the cities of Vitória da Conquista (BA-262 highway); Caetité (BR-030 highway); Livramento de Nossa Senhora and Rio de Contas (BA-148 highway) Rail transportation is geared towards ore disposal and is currently carried out by VLI Multimodal S.A railroad, through the old railroad, the Federal Railway Network A.S. (RFFSA S.A.). The city has a ring road, extension of BR-030 Highway, which allows the diversion of heavy vehicles. It also has the sub-headquarters of the Regional Traffic Circumscription (Ciretran) and State Department of Traffic (Detran), Besides the Department of Transit and Urban Transport of the municipality (DTTU). A Ponte Pênsil (The suspension bridge). The Bruman culture is diverse and closely linked to the rural roots, which in a way, whether, want or not, has been suffering decadence. Religious festivals such as Saint John, Saint Peter Revelry of kings have been losing strength. Revelry of kings is also a very traditional party in the municipality, but has greater strength in the rural area. Saint Peter, the feast of Saint Sebastian, Bom Jesus and the feast of Our Lady Aparecida are very traditional religious feasts, but the party that has grown a lot is the cavalcade, which happens from north to south of the municipality, either to fraternize with friends and family, or to enjoy shows of bands and artists of sertaneja music. The sports achievements in the city are mostly amateur level, such as Maratoninha (Child marathon), for children up to 12 years, which is held annually on October 12  And football tournaments in the neighborhoods and in the countryside. The most important sporting events in the city are the futsal championships and the Brumado Ecological Race to Rio de Contas. This race is one of the most important cycling competitions in Bahia and is played in several categories, with the participation of athletes from all over the country. The competition is interstate and is recognized by the Federation of Brazilian Cycling and the Brazilian Cycling Confederation, and the score serves to define the national ranking. The Brunadian futsal is one of the main sports practiced in the city, a sport in which Brumado futsal is four times Bahian champion. Another common sporting event is the capoeira wheels. The athletes are baptized, and graduates, receiving colorful ropes, tied at the waist. These strings correspond to your graduation. There are 15 national holidays in the city, including ten national, three municipal and one state, and one optional point. National holidays are: January 1 (International confraternity), Passion of Christ, April 21 (Tiradentes), May 1 (World Labor Day), Corpus Christi, September 7 (Independence of Brazil), October 12 (Day of Our Lady of Aparecida), November 2 (Day of the Dead), November 15 (Proclamation of the Republic) and December 25 (Christmas). The municipalities holidays are: June 11 (emancipation of the municipality), January 20 (Saint Sebastian's Day, patron of the city) and August 6 (Bom Jesus Day, patron saint of the city). State holiday, only one: July 2 (Independence of Bahia). Optional point: Ash Wednesday (until 2:00 p.m.). ^ a b c d e f g h i j k "Perfil do Município de Brumado, municipality of Brumado – Brazilian Institute of Geography and statistics". Retrieved November 23, 2015. ^ "IFDM para Brumado-BA". Retrieved December 4, 2015. ^ "100 cidades pequenas que dão um show em infraestrutura". Retrieved March 17, 2016. ^ a b c d e "Magnesita" (PDF). Archived from the original (PDF) on 2015-12-23. Retrieved April 11, 2015. ^ a b "Aspectos Gerais". Retrieved December 20, 2015. ^ a b c d e "O crescimento Urbano e a Degradação Hídrica no Vetor Norte da Cidade de Brumado-BA". Retrieved November 16, 2015. ^ a b "Origem do nome". Archived from the original on 2015-09-23. Retrieved November 11, 2015. ^ a b c d e "História da Câmara". Retrieved November 4, 2016. ^ a b c d e "Sobre Brumado". Retrieved November 4, 2016. ^ a b c d "O cinema de Brumado Enquanto Espaço de Socialização — o Cine Fátima em Brumado" (PDF). Archived from the original (PDF) on 2016-03-06. Retrieved December 1, 2016. ^ "Desafios ao fortalecimento da cadeia do algodão: o caso da região oeste" (PDF). Archived from the original (PDF) on 2016-11-05. Retrieved December 1, 2016. ^ "Zona rural de Brumado sofre com a crise da cotonicultura". Retrieved December 1, 2016. ^ "Bom Jesus dos Meiras". Retrieved December 1, 2016. ^ "Itaquaraí irá sediar o primeiro encontro dos produtores de maracujá do Sertão Produtivo". Retrieved December 1, 2016. ^ a b "A Mineração e Crescimento Urbano do município de Brumado". Retrieved December 1, 2016. ^ a b c d e f "A estratégia do desenvolvimento de Brumado-BA: baseado na mineração vs. baseado nos serviços" (PDF). Retrieved December 1, 2016. ^ "História". Retrieved December 1, 2016. ^ "História do cimento no Brasil" (PDF). Archived from the original (PDF) on 2016-03-03. Retrieved December 1, 2016. ^ "Camargo Correa conclui aquisição da CIMPOR". Retrieved December 1, 2016. ^ "Mapa da saúde". Retrieved December 2, 2016. ^ "Decreto nº 67 747 de 8 de dezembro de 1970". Archived from the original on 2016-11-09. Retrieved December 2, 2016. ^ "Longitude e latitude das cidades brasileiras". Retrieved December 2, 2016. ^ a b "Meio ambiente na Bahia". Archived from the original on 2016-01-21. Retrieved December 2, 2016. ^ a b c d "Caracterização hidroquímica da qualidade da água no município de Brumado-BA" (PDF). Retrieved December 2, 2016. ^ a b c d e f g "Relatório de Impacto Ambiental da Linha de Transmissão Brumado a Ibicoara" (PDF). Retrieved August 12, 2015. ^ "Levantamento arqueológico no alto curso do Rio Gavião - BA" (PDF). Archived from the original (PDF) on 2016-11-07. Retrieved December 2, 2016. ^ "Evolução socioeconômica da Microregião de Livramento de Nossa Senhora-BA". Retrieved December 2, 2016. ^ a b c "Barragem de Cristalândia é a solução para escassez de água na região de Brumado". Archived from the original on 2016-03-03. Retrieved December 2, 2016. ^ "Potencial de usos dos recursos hídricos para irrigação na sub-bacia de transição do Rio das Contas" (PDF). Retrieved December 2, 2016. ^ a b c "Greenstone belts sequenciais vulcanossedimentares equivalentes". Retrieved December 2, 2016. ^ "Geologia da Bahia". Retrieved December 2, 2016. ^ "Clima de Brumado". Retrieved December 2, 2016. ^ "Enchentes históricas do Rio do Antônio". Retrieved December 2, 2016. ^ "45 anos da enchente em Brumado". Retrieved December 2, 2016. ^ a b "Análise da degradação ambiental da microbacia do Rio do Antônio em Brumado" (PDF). Archived from the original (PDF) on 2015-12-23. Retrieved December 2, 2016. ^ "Acumulado da chuva passa dos 530 mm em Brumado e já é recorde dos últimos 43 anos". Retrieved December 2, 2016. ^ "Clima de Brumado". Retrieved December 4, 2016. ^ a b c d e f Prefeitura Municipal de Brumado. "Aspectos demográficos". Retrieved November 2, 2016. ^ "Principais religiões". Archived from the original on 2016-11-26. Retrieved December 5, 2016. ^ "Especial espiritualismo candomblé". Archived from the original on December 23, 2015. Retrieved December 5, 2016. ^ "Paróquia Bom Jesus realiza festa para Santa Rita em Brumado". Archived from the original on 2016-03-03. Retrieved December 5, 2016. ^ "Marcha para jesus foi um sucesso". Retrieved December 5, 2016. ^ "Brumado, minha terra, minha vida". Archived from the original on 2016-03-03. Retrieved December 5, 2016. ^ "Arquivo histórico virtual do Legislativo — história do legislativo no Brasil" (PDF). Retrieved December 5, 2016. ^ "Um breve histórico sobre a Constituição brasileira". Retrieved December 5, 2016. ^ "Constituição de 1988, contexto histórico e político". Retrieved December 5, 2016. ^ "Apuração do primeiro turno". Retrieved December 2, 2016. ^ a b "Inaugurado o novo fórum eleitoral de Brumado". Retrieved December 5, 2016. ^ "Eleições 2016: 47 845 eleitores estão aptos a votarem em Brumado". Retrieved December 5, 2016. ^ "TSE defere a candidatura de 18 candidatos a vereadores em Brumado". Retrieved December 5, 2016. ^ "Desativados cartórios de registro civil dos distritos de Brumado". Archived from the original on 2016-03-27. Retrieved December 5, 2016. ^ "Inscrições minha casa minha vida". Archived from the original on 2016-03-03. Retrieved December 5, 2016. ^ "Prefeitura divulga lista dos beneficiados dos Brisas I and II". Retrieved December 5, 2016. ^ "Brumado — histórico". Archived from the original on December 23, 2015. Retrieved December 6, 2016. ^ "Inaugurada em Brumado a agência do Banco do Povo". Archived from the original on 2016-03-03. Retrieved December 6, 2016. ^ "Cadastro de fontes de abastecimento por fontes subterrâneas" (PDF). Retrieved December 6, 2016. ^ "Fiol emprega mão de obra local". Archived from the original on 2016-12-28. Retrieved December 6, 2016. ^ "Devido a falta de repasse da Valec, operários da Fiol são demitidos". Retrieved December 6, 2016. ^ "Mapa da saúde". Retrieved December 7, 2016. ^ "Estudo da poluição inorgânica do Rio do Antônio e avaliação do risco à saúde pública na população do município de Brumado". Retrieved December 7, 2016. ^ "Seca afeta também as áreas urbanas". Archived from the original on 2016-03-03. Retrieved December 14, 2016. ^ "Governo Federal e estadual discutem novos investimentos no semiárido". Archived from the original on 2017-06-12. Retrieved December 9, 2016. ^ "Brumado vai começar a construir o novo plano de saneamento". Archived from the original on 2016-03-03. Retrieved December 9, 2016. ^ "Crea ajuda a elaborar plano de saneamento em cidades do Sudoeste". Retrieved December 9, 2016. ^ "Brumado recebe cisternas de polietileno". Archived from the original on 2016-03-27. Retrieved December 9, 2016. ^ "Programa Água para Todos". Archived from the original on 2016-12-03. Retrieved December 9, 2016. ^ "Câmpus Brumado recebe visita de representantes do poder público municipal". Retrieved December 10, 2016. ^ "Senai oferece curso gratuito de mecânico e manutenção de máquinas em geral". Retrieved December 10, 2016. ^ "Confira os cursos oferecidos pelo CEEP". Retrieved December 10, 2016. ^ "Brumado (educação)". Retrieved December 10, 2016. ^ "Uneb". Retrieved December 11, 2016. ^ "Universidade Aberta do Brasil". Retrieved December 11, 2016. ^ "Unopar". Archived from the original on 2017-03-03. Retrieved December 11, 2016. ^ "Ifba". Retrieved December 11, 2016. ^ "Secretaria de Educação". Retrieved December 11, 2016. ^ "Oportunidade de qualificação profissional pelo Projeto Qualifica Bahia e Senai". Archived from the original on December 23, 2015. Retrieved December 11, 2016. ^ "Colégio Objetivo de Brumado". Retrieved December 11, 2016. ^ "Das Ruas para a Escola". Retrieved December 11, 2016. ^ "Companhia Independente de Polícia recebe 15 novos policiais". Retrieved December 14, 2016. ^ "Novo Coordenador da 20ª COORPIN visita Eduardo". Retrieved December 14, 2016. ^ "Guarda Municipal será reestruturada". Archived from the original on 2016-11-10. Retrieved December 14, 2016. ^ "Bahia lidera número de assassinatos no país; Brumado registrou 20.". Retrieved December 14, 2016. ^ "Brumado registra pelo menos um homicídio a cada quinze dias". Retrieved December 14, 2016. ^ "Sec. Mun. de Saúde". Retrieved December 14, 2016. ^ "Coelba, Grupo Neoenergia". Retrieved December 14, 2016. ^ "Cobertura celular. Brumado - Bahia". Retrieved December 14, 2016. ^ "Rádio Nova Vida". Retrieved December 14, 2016. ^ "Alternativa FM". Archived from the original on 2016-10-14. Retrieved December 14, 2016. ^ "Tribuna do Sertão — fundador, Maurício Lima". Retrieved December 14, 2016. ^ "O Jornal". Archived from the original on 2016-03-28. Retrieved December 14, 2016. ^ "Revista Entrevip". Retrieved December 14, 2016. ^ "Quem somos". Retrieved December 15, 2016. ^ "TPC Turismo". Retrieved December 15, 2016. ^ "Rodovias". Archived from the original on 2016-03-03. Retrieved December 15, 2016. ^ "BR-030". Retrieved December 15, 2016. ^ "Programa de integração dos corredores rodoviários da Bahia" (PDF). Retrieved December 15, 2016. ^ "Anel rodoviário da BR 0-30 receberá recuperação asfáltica". Retrieved December 15, 2016. ^ "Nova Ciretran de Brumado amplia atendimento e oferece mais comodidade à população". Archived from the original on November 9, 2016. Retrieved December 15, 2016. ^ "DTTU e PM em prol da segurança no trânsito". Archived from the original on 2016-11-10. Retrieved December 15, 2016. ^ "O carnaval é definitivamente uma festa popular". Retrieved December 15, 2016. ^ "Carnaval de Brumado é cancelado por falta de verbas". Retrieved December 15, 2016. ^ "Festa de São João movimenta rodoviárias na Bahia". Retrieved December 15, 2016. ^ "Brumado celebra São Pedro até domingo". Retrieved December 15, 2016. ^ "O Brumércio". Archived from the original on 2016-11-13. Retrieved December 15, 2016. ^ a b c "Lista de 10 pontos turísticos em Brumado". Archived from the original on December 23, 2015. Retrieved December 15, 2016. ^ "As 40 melhores e menores cidades para visitar". Retrieved December 15, 2016. ^ "Exupério Pinheiro Canguçu". Archived from the original on December 23, 2015. Retrieved December 15, 2016. ^ "Festa de Reis encanta os aracatuenses e mostra a força de uma tradição que ainda permanece viva". Retrieved December 15, 2016. ^ "Calendário de cavalgada 2014" (PDF). Retrieved December 15, 2016. ^ "Dia 10 tem cavalgada da amizade em Brumado". Retrieved December 15, 2016. ^ "12ª Maratoninha será realizada no dia 12 de outubro". Retrieved January 3, 2017. ^ "16ª Corrida Ecológica Brumado a Rio de Contas marcou a história da competição". Retrieved January 3, 2017. ^ "Brumado é tetracampeão baiano de futsal". Retrieved January 3, 2017. ^ "Batizado de capoeira do Grupo Topázio será realizado neste fim de semana". Archived from the original on December 23, 2015. Retrieved January 3, 2017. ^ a b "Divulgado calendário de feriados nacionais de 2016". Retrieved January 3, 2017. ^ > "Feriados municipais". Retrieved January 3, 2017. ^ "Historiador conta curiosidades sobre a luta pela Independência da Bahia". Retrieved January 3, 2017. Wikimedia Commons has media related to Brumado. This page was last edited on 24 January 2019, at 02:49 (UTC).